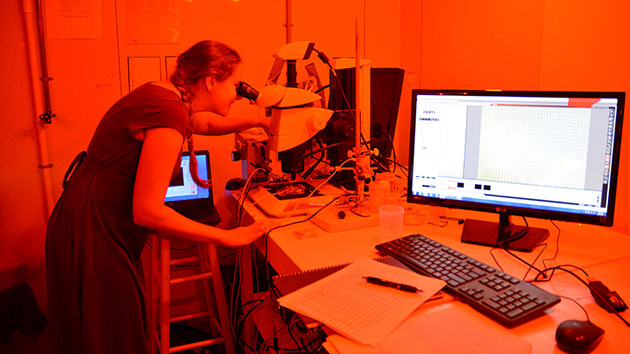 Leanne Elder, a postdoctoral student from Yale University, examines a foram under a microscope (visible on the computer monitor). They were positioned next to electrodes that measure respiration (under red light) and photosynthesis (under normal light). For her research at BIOS, Amy Maas studies one of the ocean’s smallest organisms—a delicate, shelled animal the size of a peppercorn, called a pteropod—which helps her understand current changes in ocean acidity. This month she began a collaborative research project focused on even smaller creatures—microscopic foraminifera, more commonly called forams—that help scientists understand how Earth’s climate has changed throughout history. Seafloor sediments contain millions and millions of tiny foram shells that have lived, died, and sunk to the seafloor over the ages. These fossil shells contain chemical clues about ocean temperature and acidity, when and where they lived. Scientists have used fossils like these to discern climate patterns over several thousand to millions of years, shedding light on past changes in climate and how they affected life on Earth. “They have the ability to hold their environment in their shells, giving us a snapshot of the ocean at a specific point in time,” Maas said. Forams are tiny, single-celled organisms, so all work, including their feeding, must be done under a microscope. To measure the physiology of these delicate creatures, they must be placed on a screen and carefully positioned with micro-manipulators. Tiny sensors are then moved into place to measure the environment near the organisms, including oxygen and pH levels. These have an effect on the chemistry of their shells. Maas’s collaborative work focuses on living forams collected during weekly visits to locations offshore Bermuda. Maas and colleagues, including researchers from the University of Southampton in the U.K. and Yale University in the U.S., then bring the collected organisms to BIOS’s Environmental Change Research Facility for culturing and physiology experiments. The project, which is part of a broader program called the Super-Warm Early Eocene Temperatures and Climate (SWEET) study, has the goal of reconstructing the nature of climate in a warmer interval in recent geological history. Maas and colleagues will take measurements of respiration and photosynthesis of the forams at BIOS to better understand how the forams’ environment is encoded in the chemical composition of their shells. Improving understanding through the collection of recent forams is vital to accurately interpret the information locked away in the ancient shells, said Gavin Foster, a scientist from Southampton and collaborator on the project. Ultimately these measurements will help us understand mechanisms that have led to a warming climate in the past and enable scientists to determine the response of Earth’s system to higher carbon dioxide levels. Maas said she is eager to learn how to culture foraminifera and interpret specific chemical signatures created by the organisms to look at changes in temperature and acidity. She hopes to apply similar techniques to pteropod shells gathered during two ongoing and long-standing time series studies at BIOS, to broaden her understanding of the ecology of these larger-shelled animals and how they are impacted by climate change.